Solar panels convert solar energy into DC power. A solar inverter then converts the DC power into AC power which can be used to run home appliances. Depending on the type of system excess solar energy can also be fed into the electricity grid or stored in a battery system. First we will describe the common components of the three types before going into more detail about the different systems and how they work. Most modern solar panels are made up of many silicon cells or photovoltaic (PV) cells which generate direct current (DC) electricity from sunlight. The individual PV cells are linked together within the solar panel and connected to adjacent panels using cables. Note: It is light energy or irradiance, not heat, which produces electricity in photovoltaic cells. 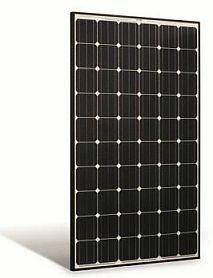 Solar panels also known as solar modules are usually installed together in strings to create a solar array. Solar panels can generate energy during cloudy and overcast weather but the amount of energy depends on the 'thickness' and height of the clouds, which determines how much dispersed light can pass through. The amount of light energy is known as solar irradiation and usually averaged over the whole day using the term Peak Sun Hours (PSH). The for the location and taking into account the orientation and tilt angle of the solar panels. Solar panels generate DC electricity which needs to be converted to alternating current (AC) electricity for use in our homes and businesses. This is the role of the solar inverter. In a string inverter system, solar panels are linked together in series and the DC electricity is brought to a single inverter which converts the DC power to AC power. In a micro inverter system, each panel has it’s own micro inverter attached to the back side of the panel. The panel still produces DC, but is converted to AC on the roof and is fed straight to the electrical switchboard. There are also more advanced string inverter systems which use small power optimisers attached to back of each solar panel. Power optimisers are able to monitor and control each panel individually and ensure every panel is operating at maximum efficiency under all conditions. (electricity consumption.) AC electricity from the inverter is sent to the switchboard where it is directed to the various circuits and appliances in your house that require electricity. Any excess electricity generated by the solar system is sent to either the electricity grid or a battery storage system if you have a off-grid or hybrid system. Hybrid systems can export excess electricity and store excess energy in a battery. On-grid or grid-tie solar systems are by far the most common and widely used by homes and businesses. These systems do not need batteries and use common solar inverters and are connected to the public electricity grid. Any excess solar power that you generate is exported to the electricity grid and you usually get paid a feed-in-tariff (FiT) or credits for the energy you export. Unlike hybrid systems, on-grid solar systems are not able to function or generate electricity during a blackout due to safety reasons. Since blackouts usually occur when the electricity grid is damaged; If the solar inverter was still feeding electricity into a damaged grid it would risk the safety of the people repairing the fault/s in the network. Most hybrid solar systems with battery storage are able to automatically isolate from the grid (known as islanding) and continue to supply some power during a blackout. Batteries are able to be added to on-grid systems at a later stage if required. The popular Tesla Powerwall 2 is an AC battery which can be added to an existing solar system. An off-grid system is not connected to the electricity grid and therefore requires battery storage. An off-grid solar system must be designed appropriately so that it will generate enough power throughout the year and have enough battery capacity to meet the home’s requirements, even in the depths of winter when there is less sunlight. The high cost of batteries and inverters means off-grid systems are much more expensive than on-grid systems and so are usually only needed in more remote areas that are far from the electricity grid. However battery costs are reducing rapidly, so there is now a growing market for off-grid solar battery systems even in cities and towns. The battery bank. In an off-grid system there is no public electricity grid. Once solar power is used by the appliances in your property, any excess power will be sent to your battery bank. Once the battery bank is full it will stop receiving power from the solar system. When your solar system is not working (night time or cloudy days), your appliances will draw power from the batteries. Backup Generator. For times of the year when the batteries are low on charge and the weather is very cloudy you will generally need a backup power source, such as a backup generator or gen-set. The size of the gen-set (measured in kVA) should to be adequate to supply your house and charge the batteries at the same time. There are also different ways to design hybrid systems but we will keep it simple for now. To learn more about the different hybrid and off-grid power systems refer to our detailed guide to hybrid/off-grid solar battery systems. The battery bank. In hybrid system once solar power is used by the appliances in your property, any excess power will be sent to your battery bank. Once the battery bank is full, it will stop receiving power from the solar system. The meter and electricity grid. Depending on how your hybrid system is set up and whether your utility allows it, once your batteries are fully charged excess solar power not required by your appliances can be exported to the grid via your meter. When your solar system is not in use, and if you have drained the usable power in your batteries your appliances will then start drawing power from the grid.